Storage Store at 4°C; make aliquots to avoid working with a stock. Please, remember to spin tubes briefly prior to opening them to avoid any losses that might occur from liquid material adhering to the cap or sides of the tubes. Confirmed reactivity Anabaena PCC7120, Clostridium butyricum, Codakia orbicularis, Cylindrospermopsis raciborskii CS-505, Nostoc sp, Rhodopseudomonas palustris, Trichodesmium sp., nodules of Trifolium repens L.
Synechococcus sp. PCC 7942 and Synechocystis sp. PCC 6803 as NifH protein is not present in those cyanobacterial species, Frankia sp. Total Trichodesmium sp. protein extract (lanes 6-11, 80 pmol chlorophyll loaded) extracted with PEB (AS08 300), and NifH protein standard (lanes 1-5, 0.05, 0.1, 0.3 0.75 and 1.5 pmol standard loaded) were separated on 4-12% NuPage (Invitrogen) LDS-PAGE and blotted 1h to PVDF. Blots were blocked immediately following transfer in 2% blocking reagent in 20 mM Tris, 137 mM sodium chloride pH 7.6 with 0.1% (v/v) Tween-20 (TBS-T) for 1h at room temperature with agitation. Blots were incubated in the primary antibody at a dilution of 1:40 000 for 1h at room temperature with agitation. The antibody solution was decanted and the blot was rinsed briefly twice, then washed once for 15 min and 3 times for 5 min in TBS-T at room temperature with agitation. Blots were incubated in secondary antibody (anti-hen IgY horse radish peroxidase conjugated) diluted to 1:50 000 in 2% blocking solution for 1h at room temperature with agitation. The blots were washed as above and developed for 5 min with chemiluminescent detection reagent according the manufacturers instructions. Images of the blots were obtained using a CCD imager (FluorSMax, Bio-Rad) and Quantity One software (Bio-Rad). 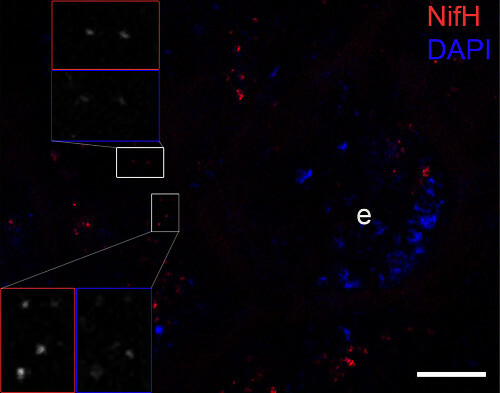 Immunofluorescence image confirming the NifH protein (bright red dots) close to the cuticle of the ileum and covering or being directly adjacent to the bacterial DNA signals (blue dots: stained by DAPI). The host DNA of the epithelium (e) was also visible. The inset frames show magnifications of red stained dots representing NifH and DAPI signals. Scale bar is10 µm. An enzyme involved in chlorophyll synthesis, present in all cyanobacteria (fixing and non-nitrogen fixing) is a member of the NifH family/superfamily. Agrisera anti-NifH antibody will not show a strong reactivity to this target. In photobionts like Anabaena sp., low nitrate growth is required to turn on the NifH expression to high enough levels to detect NifH protein. Insect dissected tissues (digestive tract, fat body, carrying NifH positive bacteria) of large workers were fixed in cold methanol (20 min, -20°C) and then permeabilized in cold acetone (5 min, -20°C). Samples were subsequently rinsed three times with PBS with 0.1 % Triton-X 100 at RT (PBST) and incubated for 5 minutes in PBST. This was followed by incubation of tissues for 1 hr with 6 ug/ml affinity purified anti-NifH antibody (Agrisera, AS01 021A) diluted in PBS-TBSA (PBS, 0.1 % v/v Triton-X-100, 1 mg/ml BSA) and 3 washings with PBST. Samples were then incubated in the dark with a goat anti-chicken IgY conjugated to Dylight 488 (Pierce, SA5-10070) for 45 min and were washed twice (PBS, 0.1%v/v Triton-X-100). Finally, the tissues were mounted in Vectashield medium containing DAPI (Vector Laboratories, H-1500) and viewed under a SP5 Leica confocal microscope with 10X and 63X objectives. Nitrogenase is involved in biological fixation of atmospheric nitrogen to ammonia. Alternative protein names: nitrogenase component II, nitrogenase Fe protein, nitrogenase reductase, FeMoCo-nitrogenase. Selected references Murukesan et al. (2019). Acclimation responses of immobilized N2-fixing heterocystous cyanobacteria to long-term H2 photoproduction conditions: carbon allocation, oxidative stress and carotenoid production. J Appl Phycol (2019) 31: 131. https://doi.org/10.1007/s10811-018-1535-x. König et al. (2016). Nitrogen fixation in a chemoautotrophic lucinid symbiosis. Nat Microbiol. 2016 Oct 24;2:16193. doi: 10.1038/nmicrobiol.2016.193. Liberti et al. (2015). Bacterial symbiont sharing in Megalomyrmex social parasites and their fungus-growing ant hosts. Mol Ecol. 2015 Apr 24. doi: 10.1111/mec.13216. Calusinska et al. (2015). Genome-wide transcriptional analysis suggests hydrogenase- and nitrogenase-mediated hydrogen production in Clostridium butyricum CWBI 1009. Biotechnology for Biofuels (2015) 8:27. Moirangthem et al. (2014). A high constitutive catalase activity confers resistance to methyl viologen-promoted oxidative stress in a mutant of the cyanobacterium Nostoc punctiforme ATCC 29133. Appl Microbiol Biotechnol. 2014 Jan 3. Plominsky et al. (2013). Dinitrogen Fixation Is Restricted to the Terminal Heterocysts in the Invasive Cyanobacterium Cylindrospermopsis raciborskii CS-505. PLOS ONE, Open Access.